Running computers on virtually invisible beams of light rather than microelectronics would make them faster, lighter and more energy efficient. A version of that technology already exists in fiber optic cables, but they’re much too large to be practical inside a computer. A Vanderbilt team found the answer in a formula familiar to college physics students – a solution so simple and elegant, it was tough for reviewers to believe. Professor Sharon Weiss; her doctoral student, Shuren Hu, and collaborators at the IBM T. J. Watson Research Center and University of Technology in Troyes, France, published the proof in today’s Science Advances, a peer-reviewed, open-access journal from AAAS. They developed a structure that’s part bowtie, part funnel that concentrates light powerfully and nearly indefinitely, as measured by a scanning near field optical microscope. Only 12 nanometers connect the points of the bowtie. The diameter of a human hair is 100,000 nanometers. 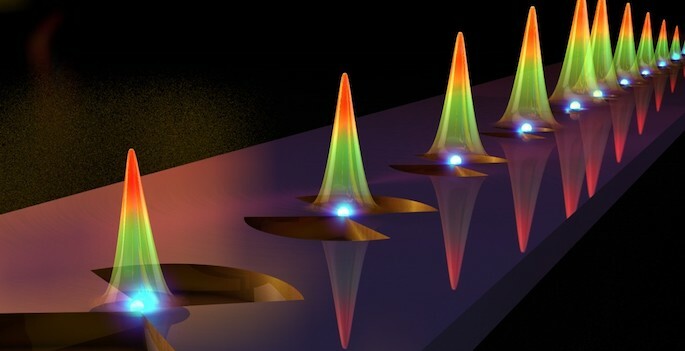 The team published its work as a theory two years ago in ACS Photonics, then partnered with Will Green’s silicon photonics team at IBM to fabricate a device that could prove it. The research began with Maxwell’s equations, which describe how light propagates in space and time. Using two principles from these equations and applying boundary conditions that account for materials used, Weiss and Hu combined a nanoscale air slot surrounded by silicon with a nanoscale silicon bar surrounded by air to make the bowtie shape. Weiss said she and Hu will continue working to improve their device and explore its possible application in future computer platforms. This work was funded by National Science Foundation GOALI grant ECCS1407777. TweetFiber optics so small you can't see them? The answer was in a first-year physics textbook.